Getting the payment gateway live within your Taxi Hub will take just minutes, and allow you to join the rest of the world in offering convenience to your customers and making your outfit appear bigger, stronger and more professional. Sure, we understand you may not have done it in the past because of high charges, but with our payment gateway provider (Stripe) they charge just 1.5% + 30p per transaction (if you have a British or European bank account) and if you want to you can pass that on to your customers if you wish, making it cost free to you. Once your payment gateway is live, then customers can even pay in advance for journeys booked using our customer bookings app (HUG) and they can pay your drivers using using the Taxi Hub Driver App. And if you think you can’t do it because your drivers are self employed, you’re wrong, if you want, your self employed drivers can created their own payment gateways within your Taxi Hub so that the money goes direct to the drivers account who takes payment. 1- Go to the settings area, found in the top right of the screen, and accessed by hovering over your company name. Note – If you are connecting a number of drivers make sure you sign out of stripe after creating each account or due to the nature of things called “Cookies” each account will not be created accurately. 2- On the menu options to the left, of the settings screen, select “Take card payments” and then follow the instructions. You will be asked to input your account details and obviously other details such as name and date of birth, however the key thing is that you do not need a merchant account. 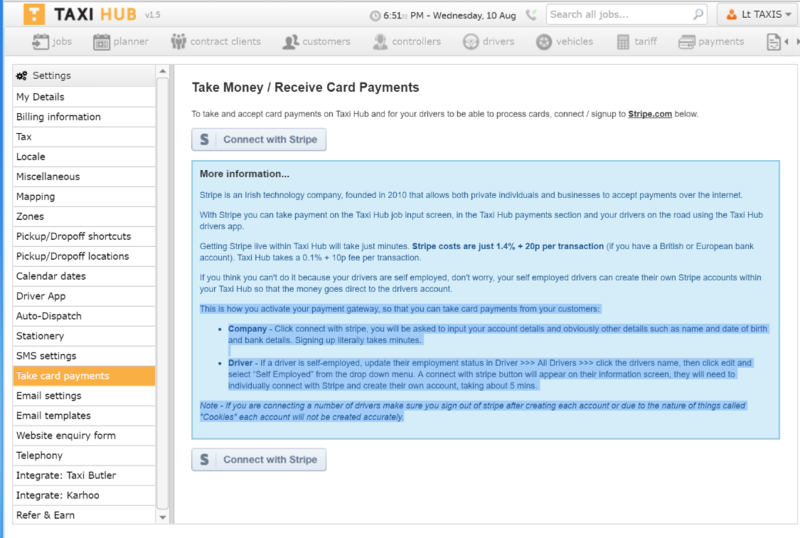 Stripe is operates in a different way to the old style payment gateways which makes it far simpler and cheaper for you. Signing up literally takes minutes, and although you may not have heard of Stripe before, they are one of the big 3 payment gateways in the world, and are huge in the US in particular. Your drivers will be able to take payments using the driver app, and customers will be able to pay you using the customer bookings app called HUG. 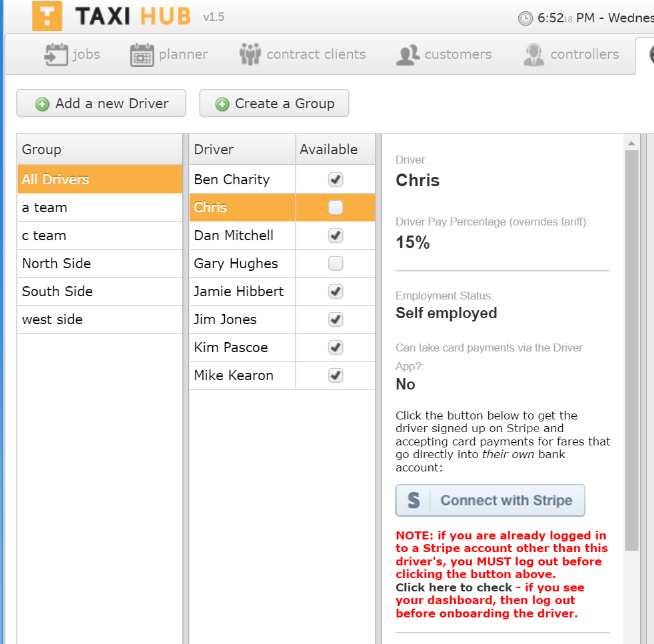 If a driver is self-employed, update their employment status in Driver >>> All Drivers >>> click the drivers name, then click edit and select “Self Employed” from the drop down menu. A connect with stripe button will appear on their information screen, they will need to individually connect with Stripe and create their own account, taking about 5 mins. Also, if you go to the “Payments” section you can create invoices for contract clients and private customers, and take payment right there. Hi and thanks for getting in touch. the payment gateway costs 1.5% +30p per transaction. 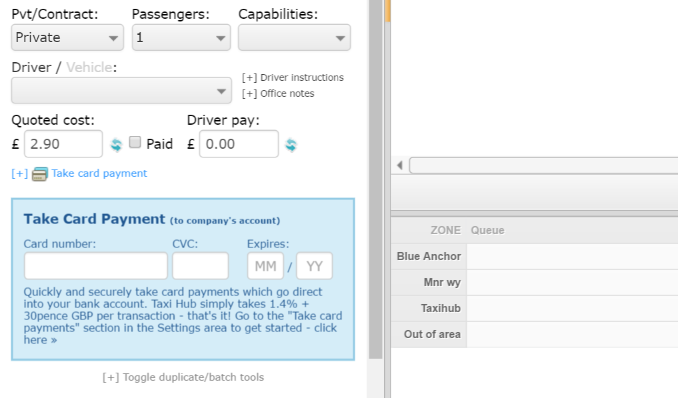 The system costs £2 per week per driver for the full desktop suite and driver apps. how can i put a cash button on my website booking widget.as i need cash and card button. We will develop that for you.